The best paying careers fall primarily in fields that require a high level of education, like medicine, business, dentistry and law. If you want to make your career choice based on salary alone, plan on spending an extensive amount of time in school studying. Anesthesiologist: Anesthesiologists administer anesthesia to patients undergoing surgery. It's a highly precise and stressful job that requires extensive career preparation. Salaries now average more than $200,000 a year, making the necessary 12 years of education and training worth the effort. Surgeon: There are cardiac surgeons, neural surgeons, orthopedic surgeons, and others. Surgical jobs all require a steady hand and extensive training to enter the field. These high-stress positions involve long and intense surgical procedures, with the knowledge that a single mistake can risk the life of the person on the table. The pay varies between surgical specialties, but the average annual salary tops $200,000 per year, with some doctors making well over a million dollars a year. Obstetrician/Gynecologist: Obstetricians monitor the mother and child's health throughout pregnancy, deliver the baby and continue to treat the mother and child shortly after birth. Their knowledge and experience make the average annual salary of $200,000 per year well worth the cost. Psychiatrists: Psychiatrists are medical doctors who are trained in treating mental disorders. They can diagnose disorders, provide psychoanalysis and prescribe medicine as needed to treat patients. Within the psychiatric field, there are specializations include child psychiatry, addiction psychiatry, forensic psychiatry and emergency psychiatry. After receiving a medical degree, psychiatrists must complete a four year residency program to train in the field before being able to practice on their own. Psychiatrists can expect to make an average of more than $160,000 each year. Internist: Internists are doctors of internal medicine, usually specializing in specific fields like cardiology, gastroenterology, medical oncology, hematology, or others. General practitioners often call on internists to help diagnose and monitor undifferentiated or multi-system diseases. Internists usually work in hospitals as individuals requiring care from internists are usually very sick. While pay scales vary based on the specific specialization of the doctor, average salaries for internists can top $200,000 per year. Orthodontist: Orthodontists must spend at least two years training after receiving their Doctor of Dental Surgery in order to practice within the specialty. Their medical training includes treating unusual bites, jaw alignment and irregular teeth. They must learn to fit and apply braces, retainers and other orthodontia. Annually, orthodontists can expect to make around $200,000 each year. Dentist: After graduating college and receiving a Doctor of Dental Surgery degree from an accredited institution, dentists can expect to make an average of $160,000 per year. 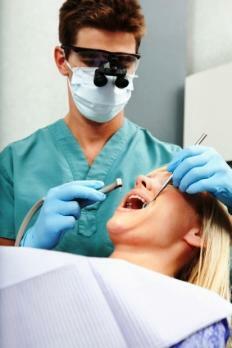 Dentists take x-rays, diagnose and treat cavities, gum disease and other dental health maladies. CEO: Chief Executive Officers of major companies generally experience high levels of stress and long hours, but for many of them the $160,000+ salary is worth the cost. CEOs typically have an MBA, JD or other advanced degree as well as extensive experience in business, finance and the work of the company they run. Marketing Manager: Marketing managers have to know how to communicate well both internally and externally, promoting their business to make it well-known and profitable. With current trends in marketing moving to the web, marketing managers need to stay on top of the latest technologies to keep up with the competition. While you can get a job as a marketing manager without an advanced degree, an MBA will make you more desirable to larger companies willing to pay you the big bucks. Marketing managers can expect to make between $50,000 and $100,000, depending on the company and field. Lawyer: Not all lawyers rake in the money. Public defenders and prosecutors that work for the government may only make $40,000 per year, but if you specialize in patent law, tax law or business law, you can get a well-paying gig for a large firm earning in the six figures. The best paying careers usually require an initial investment in education and training before paying off in salary. Make sure you're fully prepared for the rigors of the medical and business fields before pursing one of these careers.